I felt I needed to reinvent myself to change a condition in the world I couldn’t tolerate, which was the unwillingness of people to acknowledge each other when it was deserved. I now had a new mission, purpose and passion: to have people in every walk of life feel valued and appreciated! 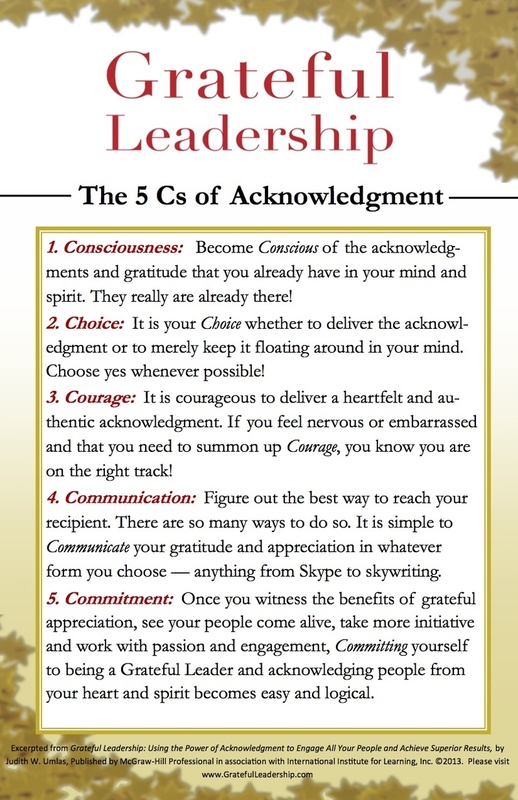 In order to get people on board, I developed the 5 C’s of acknowledgment: Consciousness, Choice, Courage, Communication and Commitment. Can you see how this could change a server’s whole day? A participant in the midst of a webinar I led on The Power of Acknowledgment texted this message to all: “I’ll be right back! I have to acknowledge my boss!” and soon after, “I DID IT!” Our conversation had brought his boss to mind, to Consciousness. He turned the great thoughts he had been having about him for months, or even years, into a heartfelt acknowledgment! So what can you do in your daily life by being Conscious of the difference people make to you? Reinvent yourself and the world around you! Read the poster of the 5 Cs on a daily basis. Show appreciation. And stay tuned for the second C, on “Choice”!